From weapon to domestic ware – what does this trench-art pitcher tell us about the First World War experience of Cook Islands soldier Terekia Taura? Among the belongings of the fallen soldier Private Terekia Taura was a metal pitcher engraved with his name and floral motifs, reminiscent of the plants of his Cook Islands homeland. Taura arrived at the Western Front in time for the particularly harsh winter of 1916. A world away from his birthplace of blue skies, white sands and turquoise oceans, Taura was one of 47 men who enlisted in the first contingent of the Rarotongan Company, which fought alongside the New Zealanders. 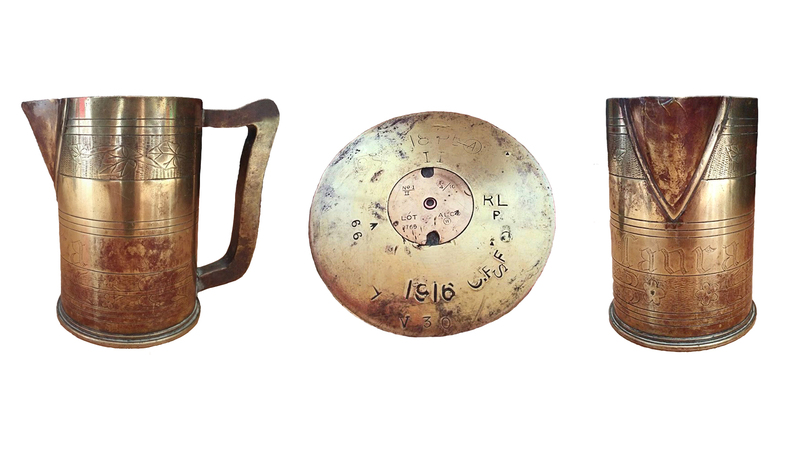 Fashioned from an unused shell casing, the pitcher is an example of what has come to be known as ‘trench art’, so-called because it was believed these objects were mostly made by trench-bound soldiers during breaks between combat. In fact, most were made away from the front line during periods of recovery or by civilian artisans. Atiu-born Taura left the Cook Islands in late 1915, heading first to Auckland’s Narrow Neck Camp for four months’ training. As the recruits left the Cook Islands, their families went into ceremonial mourning for six months, believing they would never see their sons, brothers, husbands and uncles again. 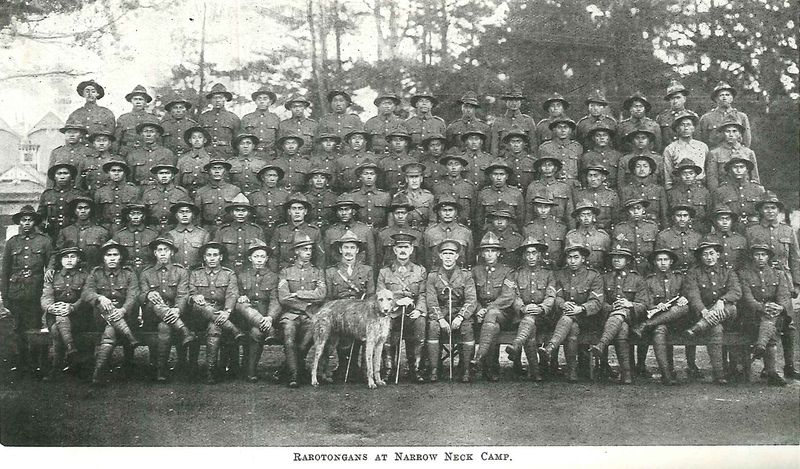 Cook Islands soldiers and their mascot pose for a photograph at Narrow Neck camp in Auckland before their departure for war. Image from The War Effort of New Zealand. By the time Taura arrived in Auckland, the war had been underway for a year. Despite being fit and healthy and eager to enlist, Taura would have been turned down if he’d volunteered any earlier. Initially the British Army would not recruit from many of the Empire’s smaller colonies but eventually relented as expectations of a short war became increasingly unlikely. After training, Taura and his unit joined the 3rd Maori Contingent of the New Zealand Expeditionary Force. He signed his vaccination permission slip with an ‘X’ because of his illiteracy. Like his fellow Cook Islanders, Taura could not speak English but was probably able to communicate with his Māori comrades. After a month helping the British protect the Suez Canal, Taura was posted to the Western Front in France late 1916. There he dug trenches in the Battle of the Somme while being subjected to heavy shelling, gas attacks and bombing from the air. A mere six days after arriving, Taura made his Last Will and Testament. Six months later Taura developed tonsillitis and was sent to the 2nd New Zealand General Hospital at Walton-on-Thames. His medical notes recorded that the “Patient cannot speak English but … reported sick with an enlarged gland in the neck and cough.” Further notes of trouble in the left upper chest were likely to be the first symptoms of the tuberculosis, which would claim Taura’s life on 8 January 1917 at just 23 years of age. The trench-art pitcher made for or by Terekia Taura, and left at Walton-on-Thames hospital following his death. Image courtesy of the New Zealand Women's Association. At the time Taura was declared “seriously ill” in November 1916, it would have taken many months for news of his condition to reach his home, assuming there was somebody there who could read English. Records show a telegram notifying of Taura’s death was sent to the Cook Islands but to whom is not known. Taura was buried in Walton-on-Thames Cemetery. Taura was one of eight from the first Rarotongan Company contingent to die from sickness, compared to two who died from gunshot wounds. This illustrates that the greatest danger to Pacific Island soldiers in the First World War was not enemy fire but European diseases, particularly in the relatively cold climate of the northern hemisphere. When viewed alongside other challenges such as their struggle to adjust to wearing boots and the army diet, the threat of dying from a foreign disease shows just how far men like Taura were from home.